This is a little idea that's been in the back of my mind, and I think "Celebrating MOM" is the perfect excuse to bring it out! It's so easy to make, you'll feel guilty about giving it as a Mother's Day present! Although, cutting out the butterflies will probably take you a good 40 minutes, but that's nothing a cup of tea and a Jane Austen DVD can't solve, right? 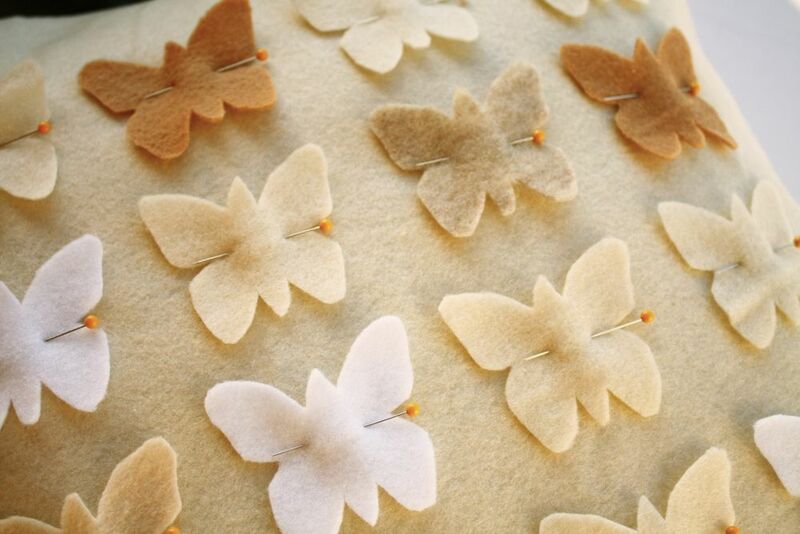 And cut out 16 felt butterflies in whichever colors your little heart desires. 4. Take the pillow cover off, and pin the butterflies on, within your marked space. 6. 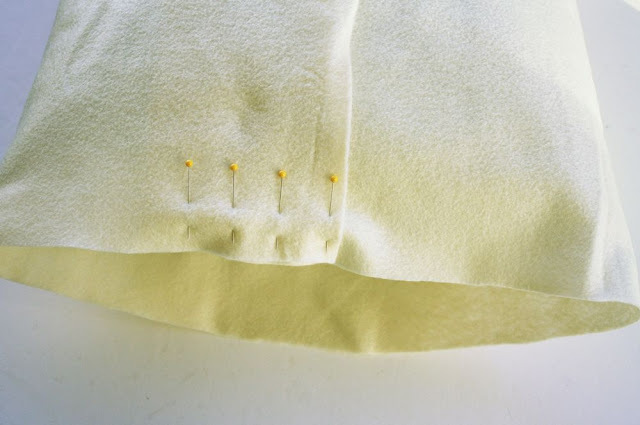 With the pillow cover inside out, wrap it around your pillow and pin the top overlap, as pictured, then slip the pillow out, and sew both sides closed. Turn it right-side-out, and use the slit in the back to put your pillow form back in! All done! 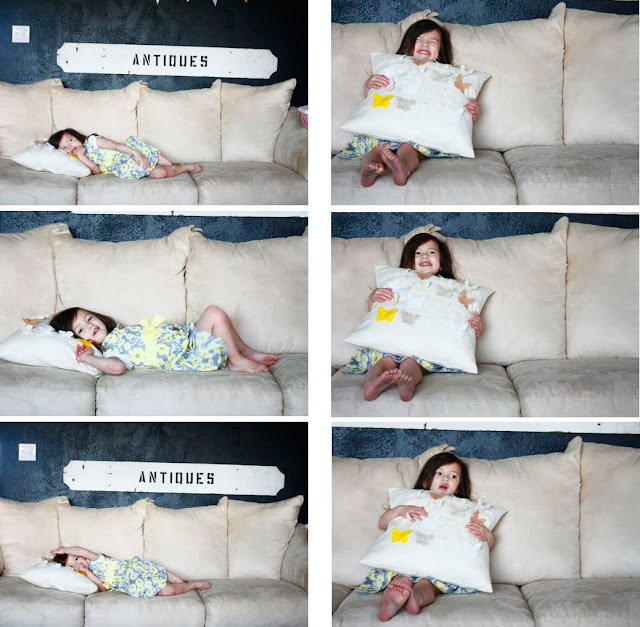 And have fun adding a little whimsy to your sofa! The felt makes it nice and snuggly, too! 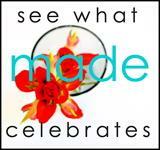 Be sure to enter Blue Eyed Freckle's ADORABLE headband giveaway at Made, as well! I LOVE this...I'm adding it to my "if I ever have another baby and it's a girl she's getting a butterfly nursery" file! Disney, this is so pretty. Oh, this is so nice!!! I suppose, this would be a great present for my MOM on Mother Day. Thanks a lot for idea! 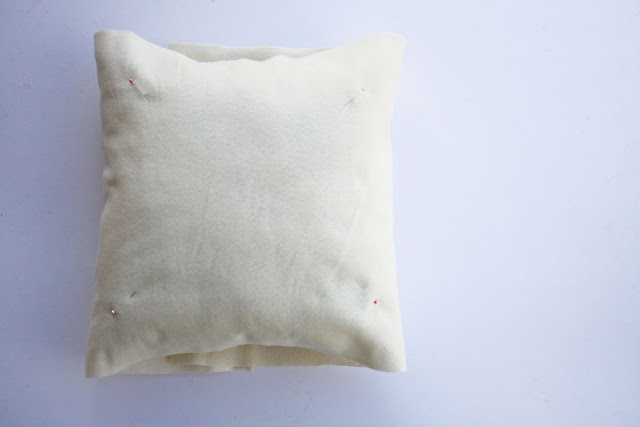 Awesome pillow idea! I thought they were so pretty on the scarf you made as well. Thanks for sharing this tutorial! OK, I love the tutorial, but I especially love seeing pictures of your beautiful daughter happily sporting your creativity! Crafterhours: That version is the BEST!!! I pretty much have every line memorized. I seriously think it's better than the book. oh so pretty! i love this more than i can even tell you. i can make myself one first right? as my own gift? OMG I love this. My daughter is obssessed with butterflys right now. I may have to attempt this. This is so pretty! You are a genius, as always! I am loving felt lately. Thanks! 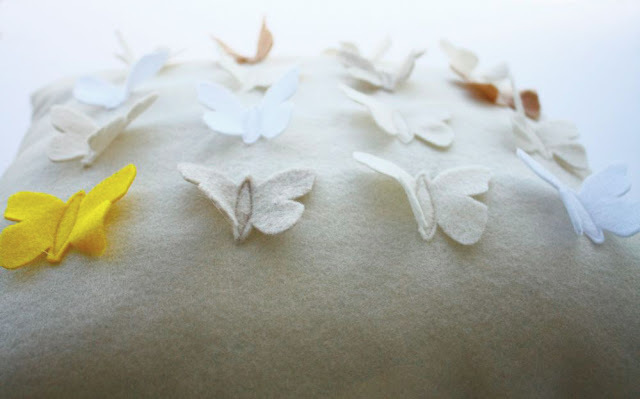 I'm definitely going to make one for my daughter's room, its already themed with butterflies! *gasp*! My friend's daughter is getting one for her first birthday. Precious and perfect. Thank-you! So pretty and cute! As always:). Adorable!!! I love those little butterflies you made! Great idea! So creative! I'll be sure to include this in my week in review on Saturday! Wow! This is sooo pretty! I'm usually not a butterfly person, but I love this one! You never cease to amaze me Disney! This is such a great idea! 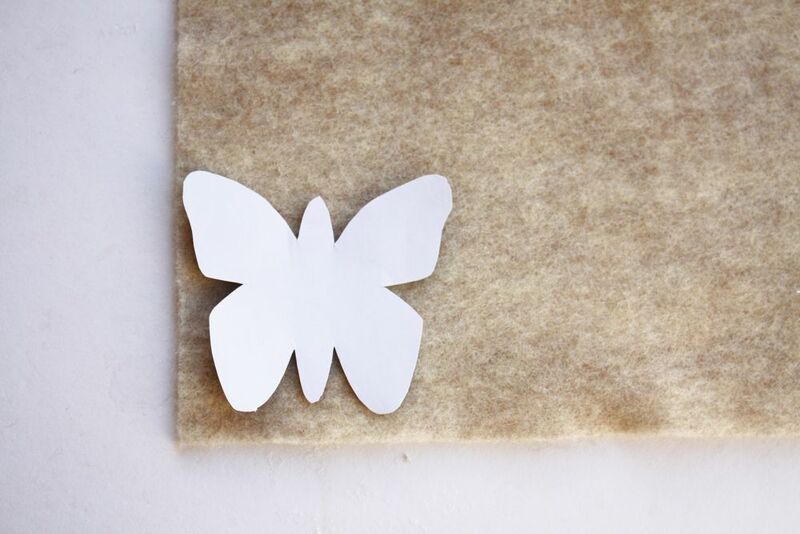 I've seen lots of fun tutes on making fabric or paper butterfly collections that are framed. 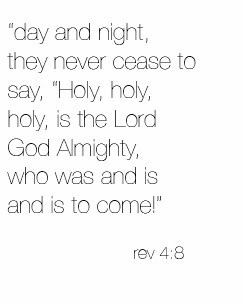 I love the idea of translating that into a throw pillow. Love your subtle color combo as well. Lovely. Beautiful pillow! FYI...you can use felt in a die cut machine if you have access to a die cutter. 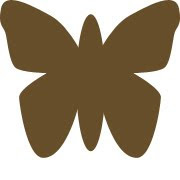 I am a teacher and my school has a butterfly die cut that looks almost exactly like the one you used. This is a super fast way to get those butterflies (or other images) cut out! Disney just wanted to let you know that I decided to make my mom some throw pillows for her couch. She got it awhile ago and has not found any pillows to accessorize with. So this will be a great gift I think. 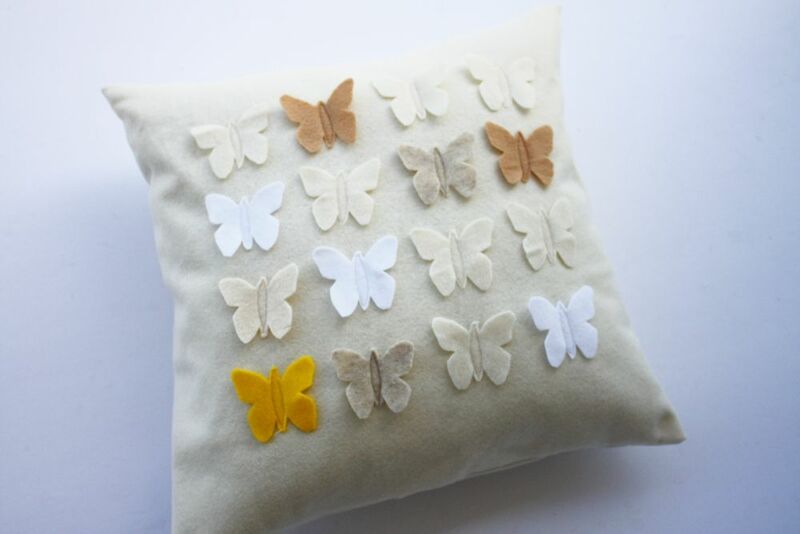 But instead of making 2 butterfly pillows with 16 little butterflies each. I've decided to make one with 6 butterflies representing her children and then one with 8 caterpillars representing her grandchildren. Then in her card I think I will write something along the lines of "you once had 6 caterpillars of your own but you gave us the wings to fly, we only hope to lead by your wonderful example." As always thank you for the inspiration. This is adorable! I'd like to share a link on sewwhattoday.blogspot.com on May 6! I love it, thanks for sharing. I'm doing a give-away so head over to my blog and comment to win! So cute girl! I am so glad I found your great blog! New follower for sure!!! Have a most fabulous day!!! You come up with the most fun projects! I love what you posted this week and this pillow is so perfect for spring! Thanks so much, I'll be linking. That little fluorescent yellow butterfly in the corner impelled me to comment. I LOVE this blog! Thank you for all of the inspiration - what a pleasure. Oh - How I heart your pillow. Thanks for sharing such a cute tutorial! oh ... my ... that is the sweetest hing ever. I showed my daughter and she's like "ooh! we could make that for my 'baby sister'" (her baby sister is actually the nickname for her 1.5 yo cousin). That is so precious, I am going to go scavenge in the bag of scraps to see what kind of palette I can come up with. Why, oh why, do I have no cute felt right now? I love this project SO much. Going to order felt NOW and make one Saturday. Thank you for the inpsiration! What a great tutorial! This is beautiful, thank you for sharing. 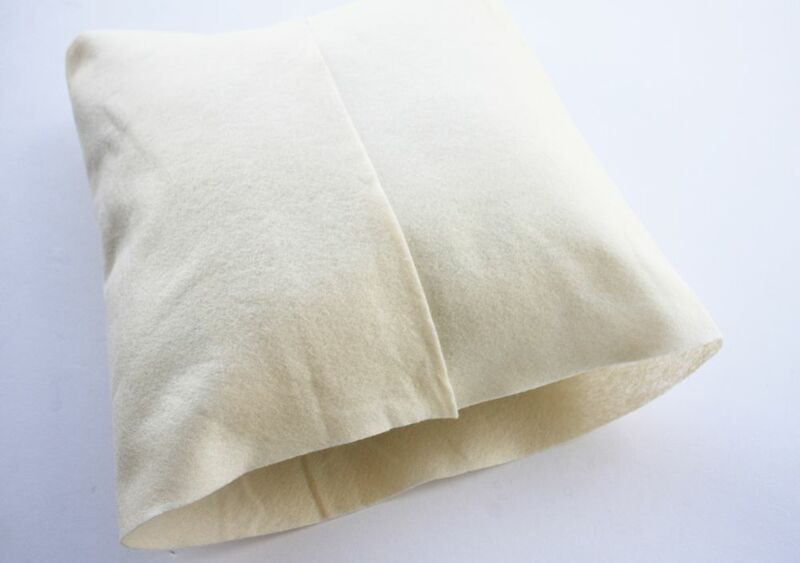 this pillow is great i cant wait to try it out thankyou for the tips. I absolutely adore this pillow Disney. It just may need to make a bee-line to the top of my sewing to-do list. I featured it as one of today's top patterns! Thank you so much for sharing it with SewSet. I LOVE this!! I'm going to tweak it just a bit and put the butterflies on the flap of a messenger bag! Thank you so much for the idea!! Best tutorial ! 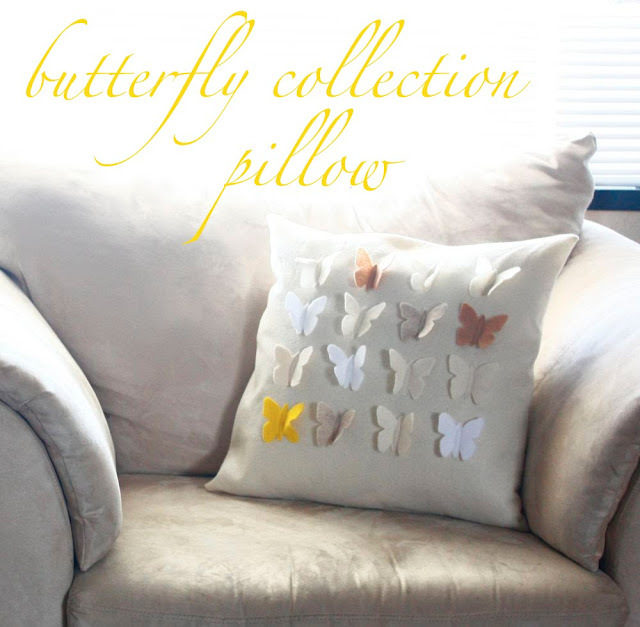 love you beautiful butterfly pillow craft ! too cute ! !